Every great subculture has a dedicated magazine, and The MINI International is the source of all things MINI for those in the know. Well into its 11th year of publication, The MINI International has announced a stylish redesign of the publication that MINI owners have come to rely on. Those who seek out the MINI lifestyle aren’t your typical car buyers. Once they’ve put the wheels to the road for the first time, MINI owners become part of the MINI Community. As a MINI car is a strong statement of personality and style sense, the MINI Community can be expected to be just as unique. This sentiment is now the focus of The MINI International. The new design will forego heavy-handed airbrushing, opting instead for photos of real MINI cars in their natural habitats. Stories will zero in on slices of life, like ’food architect’ artists Bompas & Par as they put us in their Cooper S Paceman and take us on a tour of the trendy gourmet food districts in London. If you can’t get your hands on a paper copy of The MINI International, a free iPad app can be downloaded to view the latest issue. The electronic version of The MINI International will include lots of bonus material such as short films and games. MINI has always portrayed a lifestyle of quirkiness, creativity, and individuality. 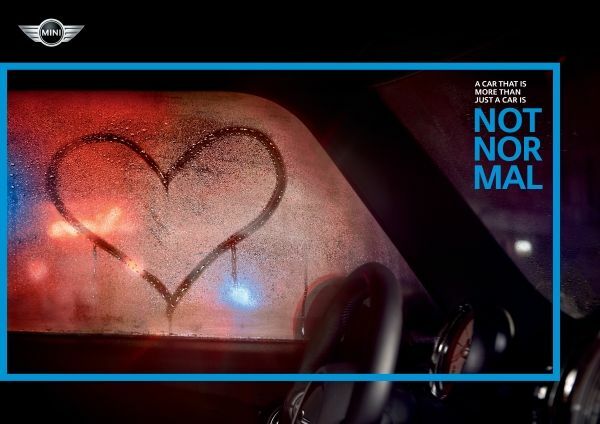 The brand launched a new campaign this week with the slogan ‘Not Normal’ to continue to recognize and delight in the fact that MINI still conveys a strong, independent, and unique character. “Brand strength has always been one of the main success factors of MINI. The continuous development of our unique brand forms the basis for further growth in the relevant customer segments and is at the heart of our communication activities”, explains Ralf Schepull, Head of MINI Brand Communication, talking about the background to the integrated campaign. Part of MINI’s charm and devotion from worldwide fans comes from the brand’s unconventional design and attitude in the world of automobiles. Long considered a ‘rebel’ among other automobiles, MINI expresses this tried and true concept through the ‘Not Normal’ campaign. Express your individuality. Find the unique MINI that is just right for you now at MINI of Pittsburgh. Visit our dealership on Baum Blvd or check us out online at www.miniofpittsburgh.com. Attention MINI drivers! Would you like to customize your radio experience and have it tailored to your likes every time you take your MINI out for a spin? Well now you can. If your car has MINI Connected, you can now enjoy a fully-integrated Stitcher SmartRadio™ app experience during every drive. Stitcher SmartRadio™ provides access to talk radio, podcasts, sports, entertainment, and live radio on-demand all in one app. In MINI models with MINI Connected, you can integrate your iPhone into your car’s infotainment system. “Our app concept allows customers to download the same services to their car that they use on their smartphone – simply by downloading the free app,” said Dimitri Meulaping Feyou, Product Manager, Entertainment at the BMW Group AppCenter. If you have questions or need assistance setting up your personalized radio experience, stop by the MINI of Pittsburgh dealership. Our friendly and knowledgeable team will be happy to help.